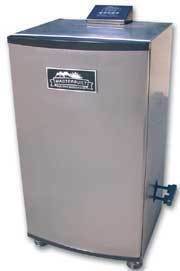 Masterbuilt Manufacturing Inc. is recalling about 10,000 "Electric Smokehouse" smokers. Smoldering wood chips used in the wood chip box can ignite into flames when the door of the unit is opened, posing a risk of burn injuries to users and property damage to nearby combustibles. Masterbuilt has received two reports of units that were damaged as a result of wood chip flare-ups. No injuries or property damage were reported. The smokers cook food slowly at lower temperatures and use wood chips to produce smoke inside the unit for flavor. Wood chips are placed inside the smoker and heated using an electric burner element to produce smoldering coals. The electric smokehouse model ESQ30B has a black powder coated outer shell with the Masterbuilt Electric Smokehouse logo on the front door. The electric smokehouse model ESQ30S has a stainless steel outer shell with the Masterbuilt Electric Smokehouse logo on the front door. The model number is located on a metal plate on the back of the unit. The units were sold at sporting goods stores sold these smokers nationwide from July 2005 through May 2006 for between $200 and $250. Consumers should stop using these smokers immediately, and contact the firm to receive free repair kit. Consumer Contact: For more information, call Masterbuilt at (800) 489-1581 anytime, or visit the firm?s Web site at www.masterbuilt.com. Volkswagen of America Inc. is recalling 362,000 Jetta and New Beetle sedans because a problem with the brake lights that could cause them to malfunction. In a letter to the National Highway Traffic Safety Administration, the automaker reports that the brake light switches in the vehicles could malfunction if they were improperly installed during a previous recall. The light could either remain on or not function at all, failing to illuminate the brakes lights and potentially lead to a crash. VW said the recall would affect Jettas from the 1999-2002 model years and New Beetles from the 1998-2002 model years, both with automatic transmission and cruise control. The recall is expected to begin in December, depending on the availability of parts. Dealers will install newly designed brake light switches at no cost to consumers. General Motors is recalling 30,793 Chevrolet C6 Corvette cars from the 2005-2006 model years because the adhesive between the removable roof panel and the frame may separate, according to the National Highway Traffic Safety Administration. The Corvette roofs could fly off as a result. NHTSA warns that "the roof panel may detach from the vehicle and it could strike another vehicle and cause injury and property damage." GM discovered the problem last year, and asked customers to have the problem fixed at dealerships. Following 21 complaints with NHTSA, GM learned the glitch also affected 2006 models and the company issued a formal recall. The roof problem affects 2005 and 2006 Corvette models that have painted, removable hard tops, which come on about 40 percent of the $45,000 sport coupes. The recall is embarrassing for GM, which prizes the Corvette as one of its best engineered and designed vehicles. The Corvette's hard top is comprised of a magnesium frame and hard plastic roof panel and weighs between 5 and 10 pounds. The roof panel has blown off when adhesive that attaches the roof to a frame separates, according to a GM spokesman. No one has been injured or killed as a result of the glitch, the spokesman said. IKEA is recalling about 133,000 packages of outdoor candles. The candles' wax can catch fire causing a high flame and posing a fire and burn hazard. I KEA has received 16 reports of incidents involving flaring of the outdoor candles, seven of which involved minor burn injuries. The recall involves the ANGAR (#200.301.24) and SAMLAS (#100.999.58) outdoor candles. The candles' container is made of silver-colored metal and measures about four inches wide by two inches high. The container is filled with white wax. The candle's wick is made of brown fiberboard. They were sold in packages of six candles. The candle name and article number is written on the instructions for use accompanying the candles. The candles were sold at IKEA stores nationwide from February 2001 through July 2005 for about $4. Consumers should stop using the recalled candles immediately and return them to the nearest IKEA store's "Returns and Exchanges" department for a full refund. Consumer Contact: For more information, contact IKEA at (888) 966-4532 anytime, or visit the firm's Web site at www.ikea-usa.com. Rainbow Play Systems is recalling its Sling Swing Seats. They can unexpectedly break in half, causing the users to fall to the ground. Rainbow has received 84 reports of broken swing seats, including one report of an injury. A 2-year-old girl suffered a broken wrist when she fell to the ground after the sling swing unexpectedly broke in half. or misuse can lead to serious injury. Play structures with the sling swings contain a metal plate on the main beam with the writing, "Rainbow Play Systems Inc. 1-800-RAINBOW." The swings were sold by Rainbow distributors and dealers nationwide from July 2004 through February 2005 as part of Carnival, Sunshine and Rainbow Series play structures that cost between $1,500 and $2,000, or about $50 to $60 for the swing seat when purchased as a stand alone accessory. Consumers should immediately stop using these sling swings and contact Rainbow Play Systems, Inc. or return them to their place of purchase for a free replacement swing. Rainbow has contacted consumers directly who purchased the recalled sling swing seats. Consumers who have already had their swing seats replaced by Rainbow are not affected by this recall. Consumer Contact: For additional information, contact Rainbow Play Systems at (800) 724-6269 between 8 a.m. and 6 p.m. CT Monday through Friday, or visit Rainbow's Web site at www.rainbowplay.com. Aqua-Leisure Industries is recalling about 320,000 Simple Set Pool Ladders. The plastic step support clips can be assembled upside down, causing the ladder steps to break under a user's weight. Aqua-Leisure and CPSC are aware of nine incidents. There have been six reported injuries, including a concussion, a broken arm, fractured ribs and a wrist sprain. The ladders were included with Aqua Leisure Simple-Set inflatable pools that range from 12- to 18-feet in diameter. The white metal arched ladders have two, three or four plastic blue steps on each side of the arch with two blue cross bars just above the top step. White plastic and metal clips are used to connect the steps to the ladder. Each step is molded with the words "Aqua Leisure." Discount department and toy stores nationwide sold the items from January 2002 through August 2005 for between $90 and $200, depending on the size of the pool. Consumers should immediately stop using the ladders and contact Aqua-Leisure for a free repair kit, including new assembly instructions and color-coded support clips. Ladders should be re-assembled using the new repair kits. Consumer Contact: Consumers should call Aqua-Leisure toll-free at (866) 807-3998 between 9 a.m. and 5 p.m. ET Monday through Friday, or visit the companys Web site at www.aqualeisure.com. The potential for a gasoline leak in the 1996 to 2002 Kia Sportage has prompted an ongoing engineering analysis and investigation at the National Highway Traffic Safety Administration (NHTSA). The analysis is examining the possibility that gasoline might leak from the "steel fuel storage tank on some models" of the Kia Sportage according to NHTSA. The investigation was recently expanded to include any Kia Sportage using the same or similar steel gas tanks that are used to equip 1999 and 2000 model year vehicles. Kia has reported to NHTSA the leaks appear to be the result of corrosion in the fuel containment and distribution system. Specifically, Kia has found corrosion in the protective coating around the fuel tank as well as the mounting plate for the unit that sends fuel tank information to gasoline gauge. Kia is also investigating the corrosion problem and alleged defect. Adventure Playsets is recalling about 26,000 wooden swing sets. Defective bolts could cause the swing set frame to detach from the fort structure, posing a fall hazard to the user. The company has received 64 reports of the bolt heads twisting off during installation. No injuries have been reported. The recalled swing set models include: The Durango, Tacoma, Oddsey, Bellvue, Monarch, Grand Teton and Outlook II. The swing sets are made of wood, and feature various types of slides, swings and a fabric canopy over part of the structure. The Durango, Tacoma, and Odyssey models are pictured here. Additional models can be viewed at www.adventureplaysets.com. The swing sets were sold at Wal-Mart, Menards, and Toys R Us stores nationwide and Wal-Mart.com from February 2006 through March 2006 for about $1,000. Consumers should stop using the swings set immediately and contact Backyard Ventures to receive repair instructions and free replacement bolts for the recalled swing sets. Consumer Contact: For more information, call Backyard Ventures at (800) 856-4445 between 8 a.m. and 5 p.m. CT Monday through Friday, visit the firm's Web site at www.adventureplaysets.com. Masterfoods USA is recalling its M&Ms; Menorah. If a candle burns all the way down, the plastic Menorah could ignite and present a fire hazard. Masterfoods USA has received five reports of the Menorah smoldering or igniting. No injuries or property damage have been reported. The recalled Menorah is an eight-branch candleholder designed to resemble M&M's Brand candies. On each end of the Menorah is an M&M's Brand character holding a Star of David. The items were sold through the M&M's World catalogue, M&M's World stores in Las Vegas and Orlando, and online at www.mmsworld.com from November 2005 through December 2005 for about $30. Consumers should stop using these Menorahs immediately and return them to Masterfoods USA for a full refund including taxes and shipping and handling, where applicable. Masterfoods USA is also offering a $10 gift certificate good towards the purchase of any M&M's collectible. Consumer Contact: For additional information, consumers can contact Masterfoods USA at (800) 849-4867 between 7:30 a.m. and 4 p.m. PT Monday through Friday. About 14,000 Schwinn bicycle child carriers are being recalled because of the risk of a fall. If the seat is not fully seated on the rack, the plastic guide tabs on the carrier can break. If the tabs break, it could cause the seat to fall off. This poses a risk of serious injury to a child seated in the carrier. PTI Sports has received five reports of the carriers falling, including three reports of minor injuries, such as bumps and scratches. The carrier is a seat for a child that is attached to the back of an adult bicycle. The carrier is gray plastic with a blue rubber back and seat pad, a gray head rest, and black straps. Model number SW571T is printed on the carriers packaging and in the owners manual. PTI is printed on a yellow warning sticker on the back of the carrier seat. The carriers were sold at department stores, discount department stores, and military exchanges nationwide from September 2004 through November 2005 for about $50. Consumers should immediately stop using the bicycle child carriers. Do not return the carrier to the store. Contact PTI Sports for a free safety bracket and revised installation instructions. Consumer Contact: For additional information, contact PTI Sports at (800) 515-0074 between 9 a.m. and 5 p.m. ET Monday through Friday, or visit the firm's web site at www.schwinnbike.com.